Hope is a wonderful girl with a really nice personality. She has provided us with a three nice litters and is now retired- she will remain in our home and be the gentle companion she has always been. With a gentle spirit and loving manner, she is a great mother and companion. 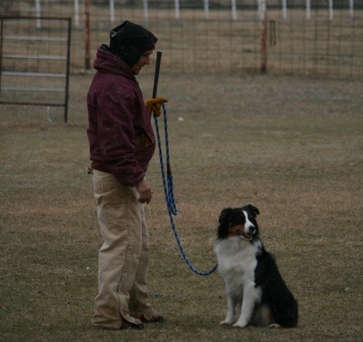 She knows how to discipline our other dogs and is not hesitant to do so when necessary. She has helped our household by bringing comic relief and LOADS of kisses! She is very shy and reserved around strangers and the camera. 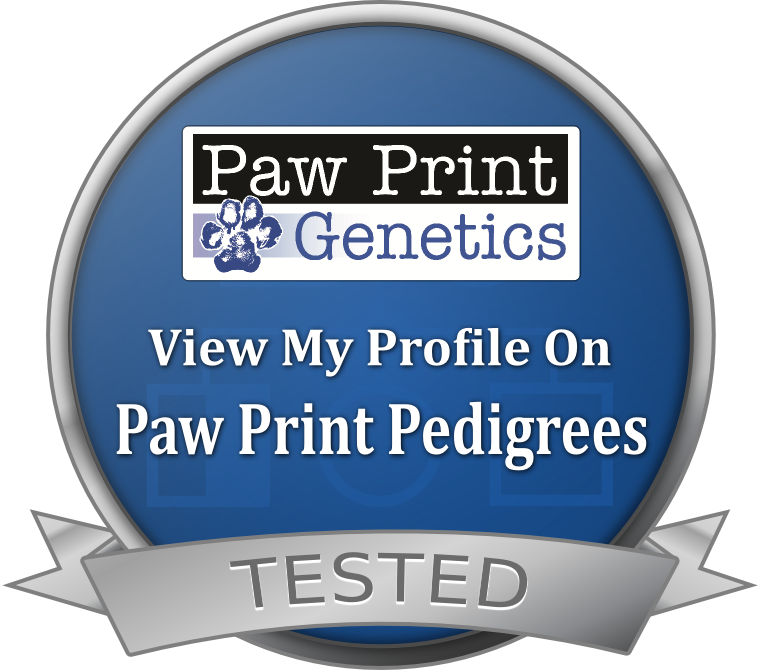 Has had several litters, some pups going on to become winners in conformation. Proven. 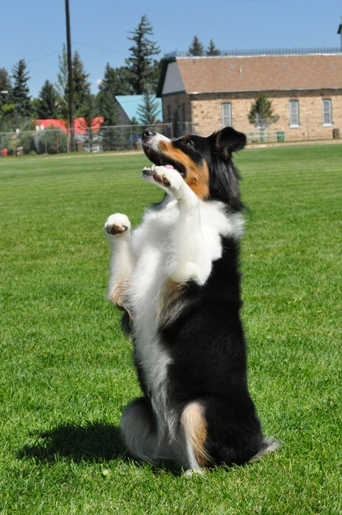 Dustee has titled with MASCA in Obedience and is working on completing her Obedience, Herding and Agility titles with AKC. She completed her Rally Novice Title on December 4, 2016. This girl has also won awards with MAMASC! She is a smart, energetic and stunning young lady who loves everyone and everything. Unfortunately, due to a costly, regrettable, and untimely decision of her breeder, Dustee will no longer be considered as a breeding prospect. This decision is beyond our control and is devastating to our program! 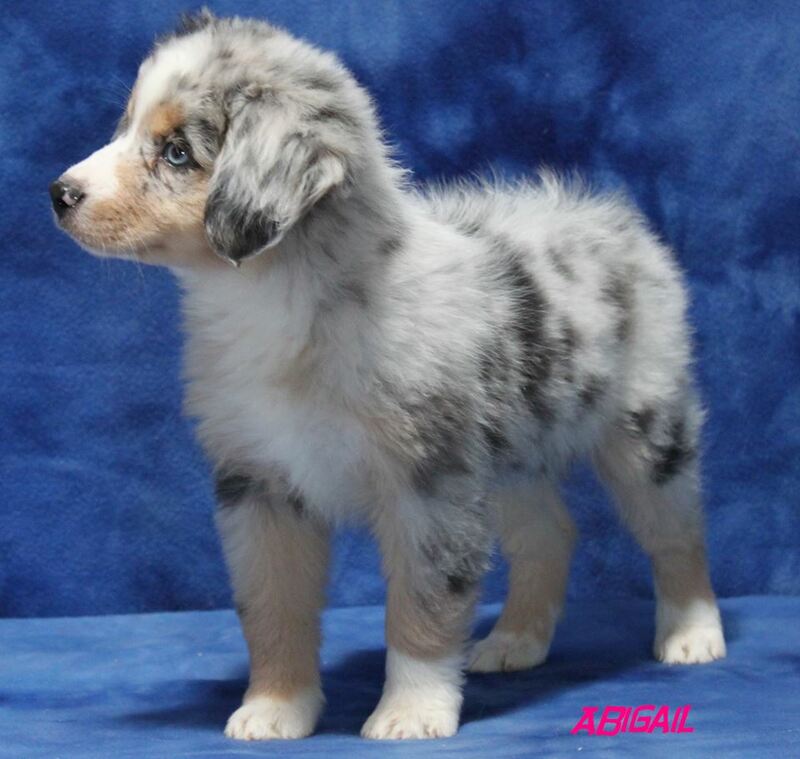 I apologize for all who were anticipating this girl having a gorgeous litter and will refund all deposits that were made. Thank you for trying to understand-. because we sure don't. 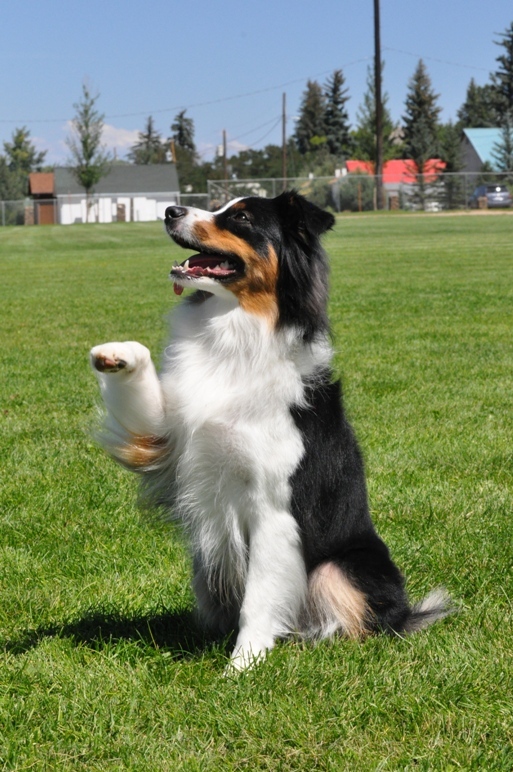 This wonderful Miniature American Shepherd will always be in our performance program running agility, obedience, rally and what ever else she pleases :) We will continue to work with Dustee and love her as our companion. That being said, Dustee will always be our pride, joy, companion, babysitter, teacher= she is our first mini but will not be our last. 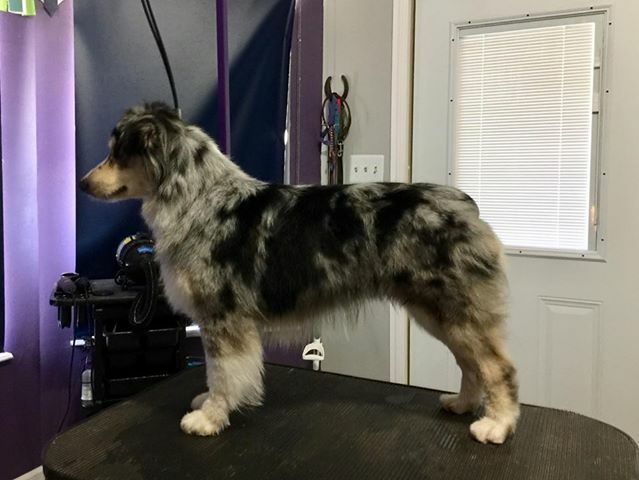 She has taught us so much about this breed that we will be building a GREAT breeding program with other quality dams we have available to us. We will also continue to learn from her until the day she is no longer with us. Thank you Dustee! 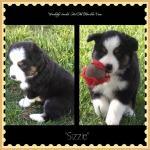 Sizzle is our big, fun, happy girl! She unexpectedly grew to 21" and has been spayed for reasons other than her height so no puppies from this line: a great disappointment. Sizzle will remain in our home for the rest of her life. 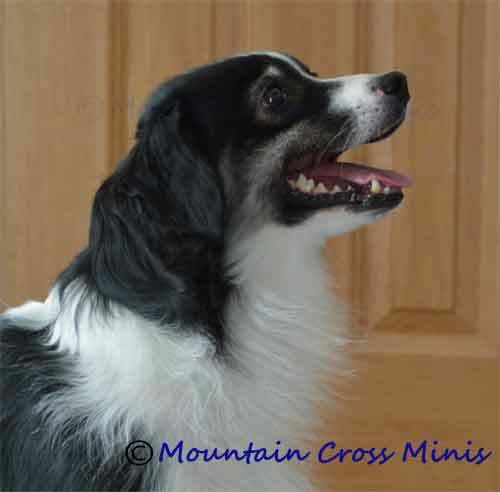 Picassos At A Mountain Cross Abbey "Abbey"
Moxie is a big, beautiful girl with an energetic and loving personality. Let her get to know you and she will show you how well she can lick! 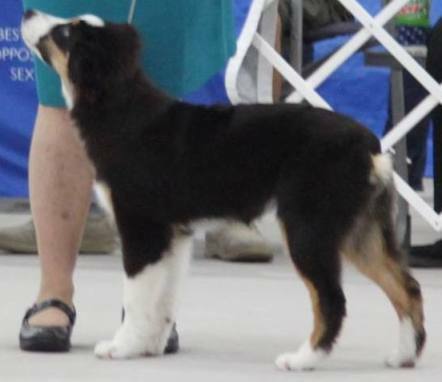 She stands 18" and is working on titles in obedience and CGC. 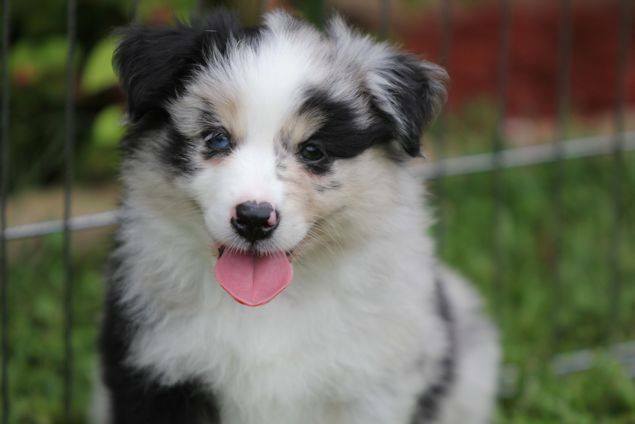 A true aussie at heart she is protective of her owner, calm and playful. 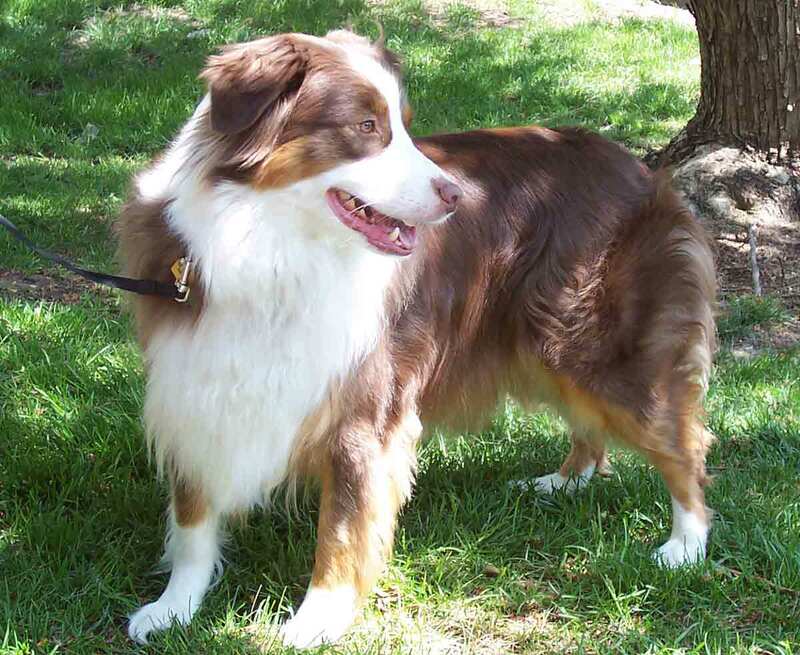 She is not shy or aggressive- just a typical aussie who has been properly socialized. 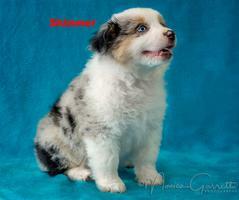 She is registered AKC Miniature American Shepherd. 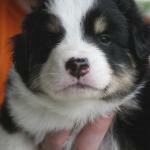 Has had one litter with beautiful results but has been spayed because of thyroid problems. Rya is our smallest girl- standing at 13.75 inches. 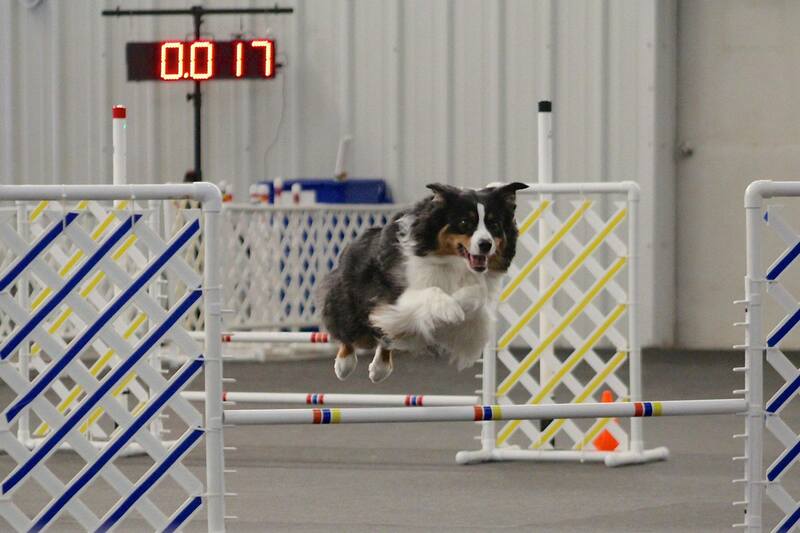 She is also our most active and is a spitfire- nothing stands in her way when she wants something. 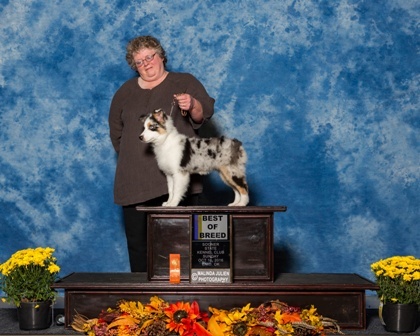 This Battlefield's girl started her career out with winning her class while the breed was still in FSS status. 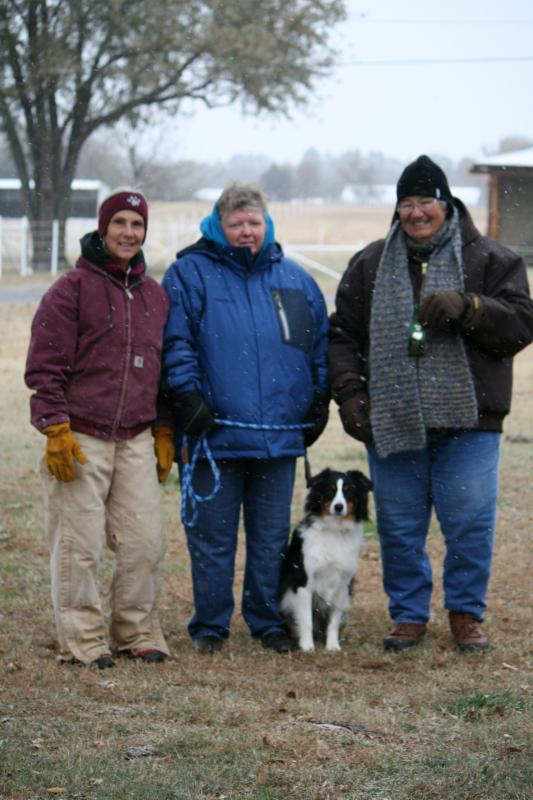 She also placed third in her group of four females. Today she is satisfied with being a companion with a big heart. Rya would play ball all day if we let her! She has been spayed so will not be used in our breeding program. We do love her and her playful attitude gives us tremendous joy. 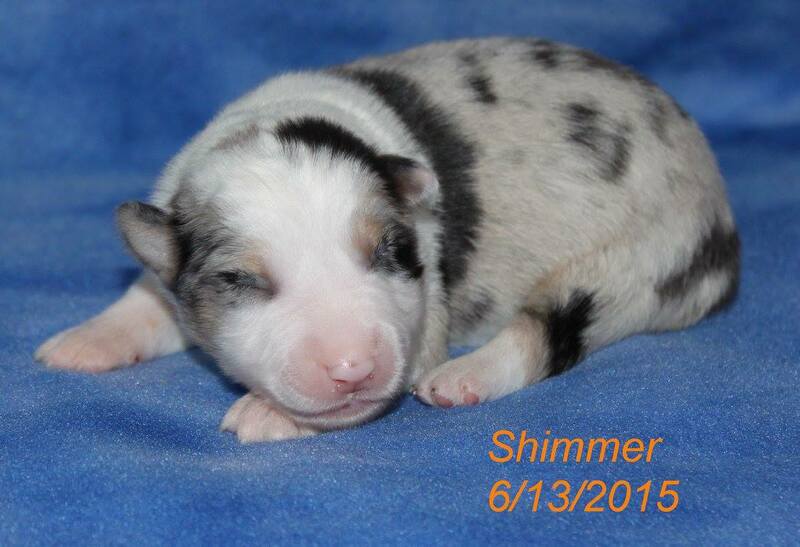 Shimmer is her name and she shines like a starlight! This girl came was such a natural in the ring and we enjoyed having her in our program for a short time, she is unable to show due to some genetic issues. 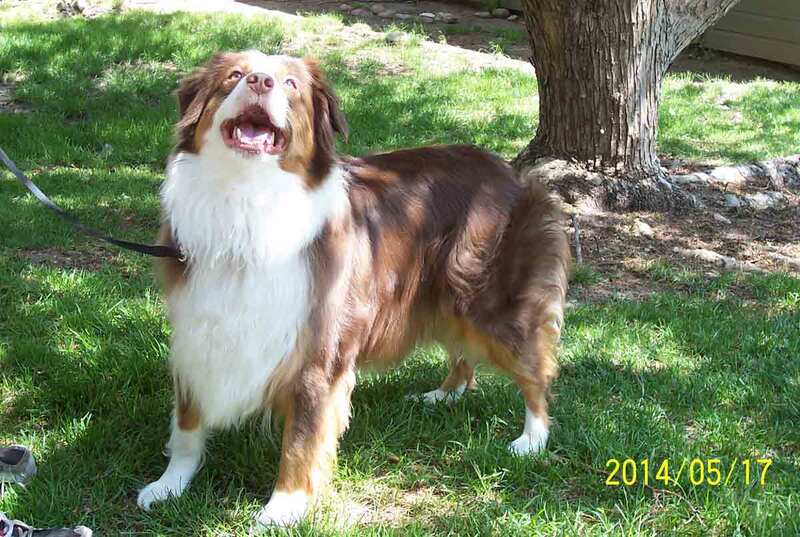 But, this girl has a new home and she is living a wonderful life as a pet with her new family! 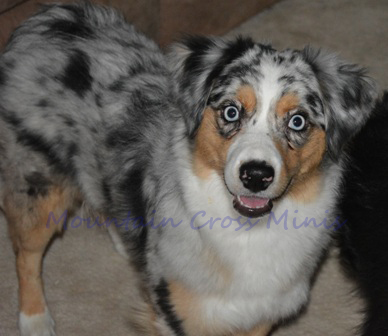 Abbey came to us from Picasso Miniature Australian Shepherds in Arizona. 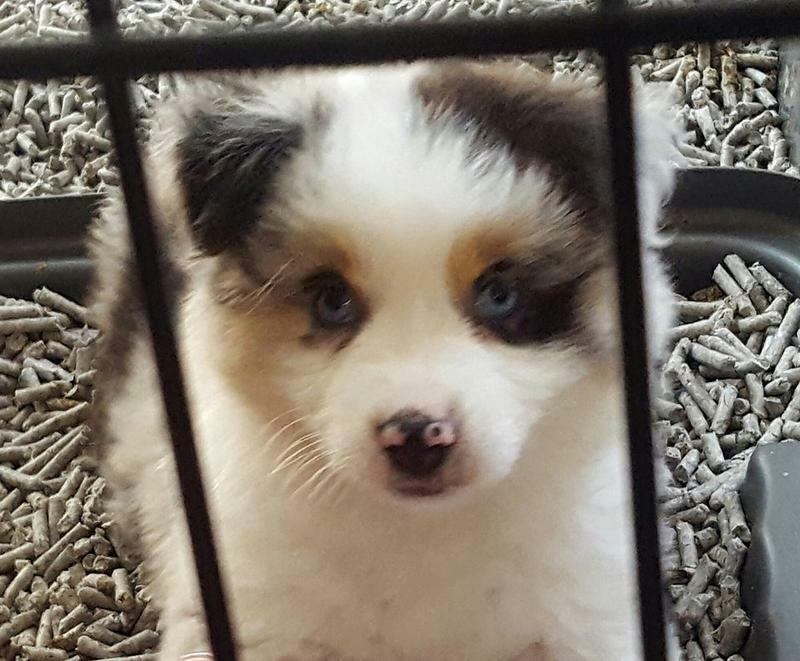 She is preparing to become a service and performance dog. 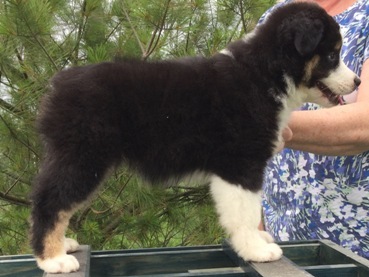 Her parents are Kilkenny's Once Upon A Time A Picasso and Patchworks Hocus Pocus (Patchworks Houdini's full brother. 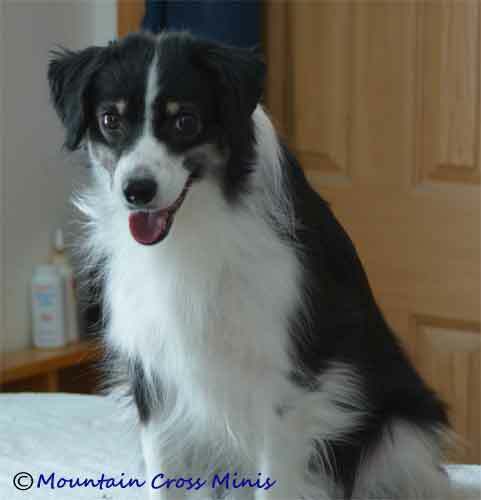 Houdini is the sire of our Latigos Mountain Cross Night Magic-Taun Taun and Latigos Mountain Cross Awesome Blossum.) She will have a full panel soon. 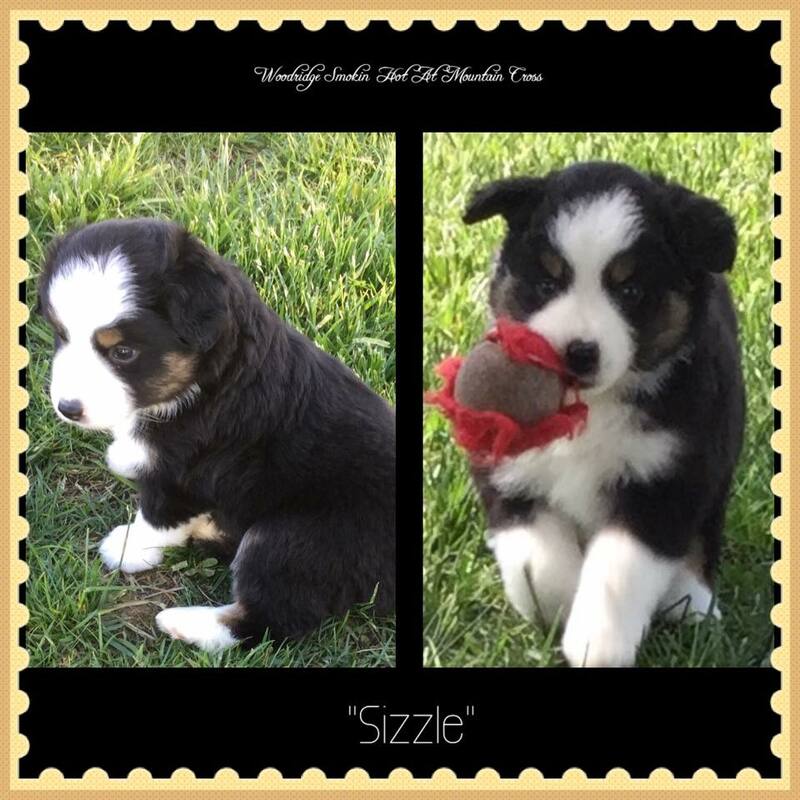 Woodridge Sizzlin Hot at Mountain Cross"Sizzle"
CH Southern Star Going With The Flow "River"
River is our newest girl and is fitting right in with the household. Standing at 16.5 she has a sweet disposition and knows how to keep everyone in their place. River earned her Championship while still with Southern Star and we hope to continue her career with Performance events and, possibly, another level of Conformation. We are very grateful to Leslie Stokes Peckham of Southern Star for giving us an opportunity to have a quality breeding girl in our program. River and Wolverine had their first litter on August 8, 2018. 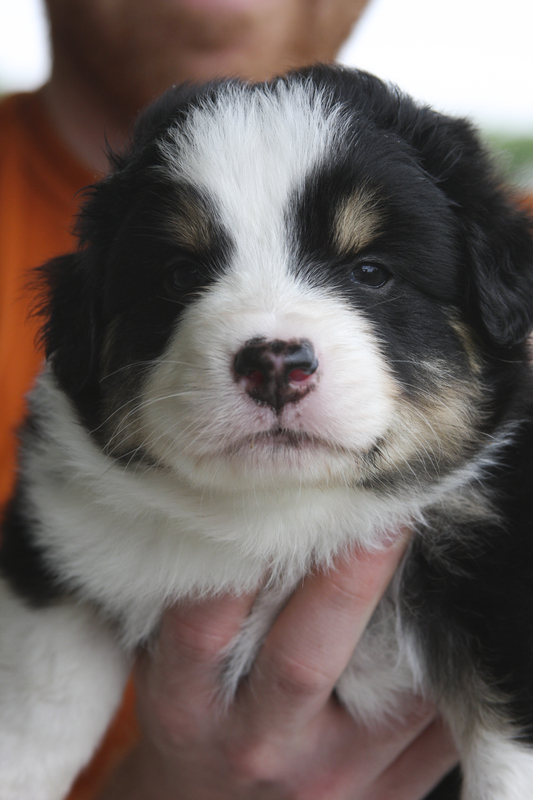 See the "Current N Planned" page for more details on the Miniature American Shepherd puppies we plan on having with her this year.